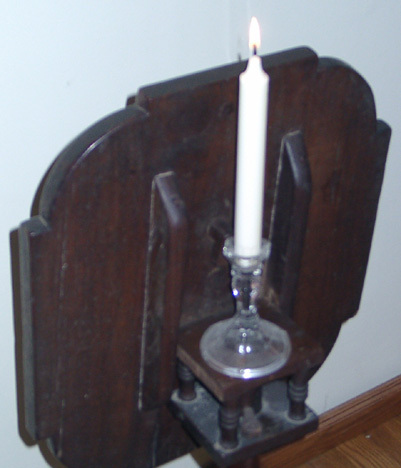 Candles were made of a variety of materials during the mid-nineteenth century. Although tallow was inexpensive, it was very smoky when it burned and the candles drooped in warm weather. 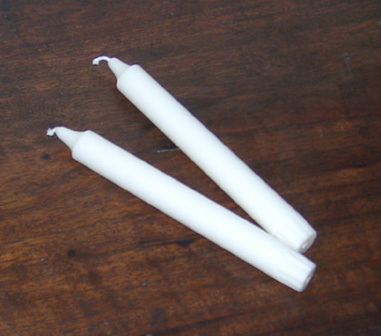 Candles made of beeswax or spemaceti were far superior but also more expensive. A compromise material was stearin -- known as adamantine from its resemblance to stone but also known as stearin. Stearin was only made commercially because of the complicated process used to produce it. Very simply, it was made from animal fat that had been mechanically and chemically processed. The result was a material with a higher melting point than tallow and a long burning time. These candles are made of 100% stearin and roughly the same appearance as period candles. The only feature we question is the fluting on the base. We have seen originals with tapered bases but the fluting is probably a modern touch to make them fit candle holders more easily. The candles are 7 3/4 inches high and, in still air, will burn about 7 hours. The candle at the left is shown on a candle table. This table flipped up to allow a candle holder to be placed on the square base in the middle and the entire base could be rotated so the turned up table top served as a wind break. And just one note about our candle prices. We have seen vendors offering the same candles for as much as $3 each. We'll be happy to take it if you want to offer us that much for each candle but there isn't the need to spend that much.